As you may have noticed, we are in full nature hike swing over here with the arrival of spring in Michigan after a long winter! Yes, we do hike in the winter but it's harder to include some of the other aspects of our hikes during that time, namely nature journaling. Pencils aren't easy to grip in gloves, wink. But fall, summer and spring are glorious seasons in this part of the country for nature study so the moment it's warm enough to sit and pull out of sketchpads on various trails and parks, we do! Part of what has been fun this year for my 7 and 8 year old has been the addition of a field microscope. I'm noticing that my two sons, while only 18 months apart, are quite different in the way they approach nature study. My eldest is more xtroverted so when we are on hikes, with friends or just us, it's a bit harder for him to settle down and sketch in the moment. He will do so, but does get a bit more distracted and is often ready to move onto the next part of the hike a bit quicker or wander around with his magnifying glass and binoculars talking about what he is seeing. But when we get home, he loves to pull out the microscope and observe all that is going on in his specimen! (The addition of little specimen jars has been a huge hit this spring as well!). He is much more excited about pulling out his journal and sketching his specimen as seen under the microscope versus in the field! He's my 'non-fiction at heart' kid so I love seeing this side of him emerge. My second, by contrast, is much more introverted by nature and has zero problem zoning out his surroundings on a hike and focusing in on a tree, flower, bark or insect....studying it carefully and sketching it! He loves to look at it later under a microscope as well but feels no need to sketch that! 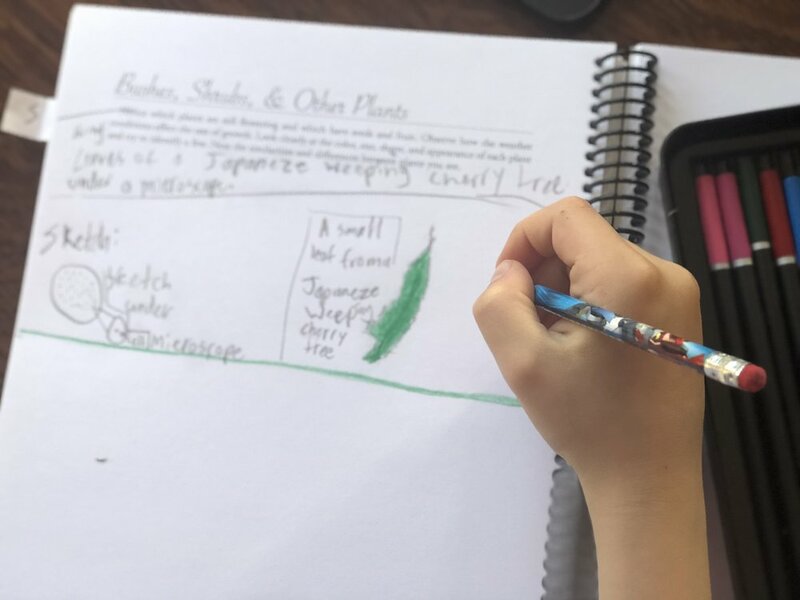 All this to say is that nature journaling will look different with each child, for some, fieldwork is immediate, in the moment...and for others, more of the learning and processing may take place more in the quiet of the home. 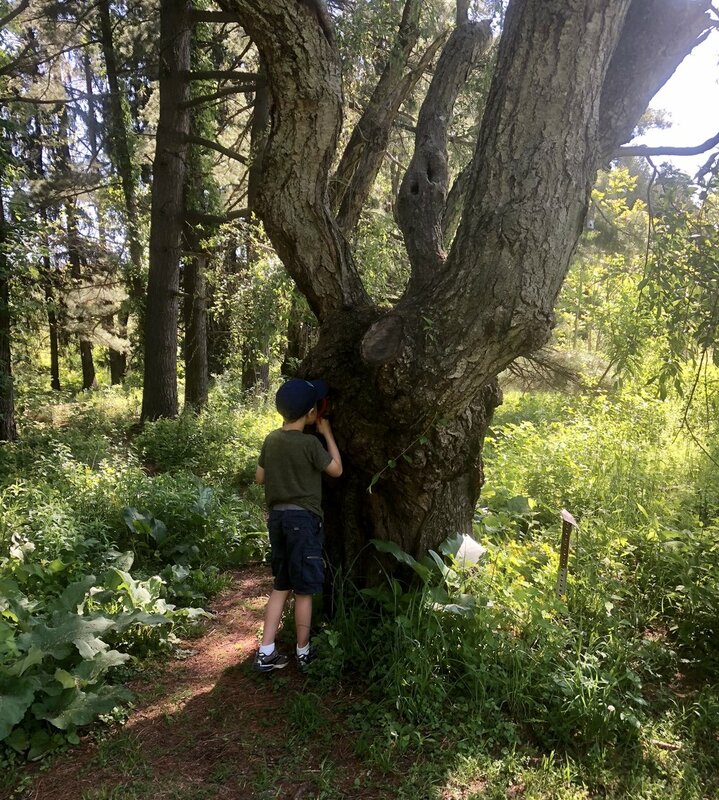 Either way, Ive loved how nature journaling has allowed us to be more intentional of our surroundings and notice all the 'treasures' as my four year old puts it, around us. Linking some of our favorites below and know that we didn't invest in all this overnight. I'd say it's a culmination of the last two years of birthday gifts, Christmas presents, end of year gifts, etc...we started small, just with binoculars and a magnifying glass and slowly added from there. Feel free to comment and add in anything else that makes your hikes more enjoyable! For under $10 you get a set of six and it's fun to have a few pairs at home and keep a few in a backpack or car! Each of mine have their own in their backpack. We've used a few different brands and you could just share one set, but it's been easier for each of mine to have their own set/case. And a hard case is a must given how tossed about they get on the hikes, smile. I've noticed they've taken much more ownership and pride over them than when they just shared one! Some ones we've used have included Eboo and Colore (which I can't find that set anymore as it was a few yeasr ago but this Diamond Driven set is very similar). This is exactly what we have and such a good deal! It's $9.99 and literally around the same size as the binoculars. Right now we've used it mainly at home but now that they are comfortable with it, I can't wait to take it out in the field! My dad gifted the boys these Gregory Miwok 12L backpacks (around $40 each) from Sierra Trading Post last year for their birthdays. But know that for a few years we just used their school backpacks or whatever had our hand. They got very excited last spring about carrying all their own gear so we wanted to take advantage of that especially as I had my hands full at that point with a 2.5 year old! Regarding nature journals, the boys and I are using one from Simply Charlotte Mason this year but really, you can use whatever you think is best: blank, lined, one with prompts, without. One year we did these blank ones and I loved them (and the price, wink). My four year old is using one from the Target dollar bin this year, smile.